When an area is engulfed by war, it doesn't only take a toll on people, it can hurt wildlife, too. A new study shows just how that happens in Africa. Between 1950 and 2000, 80 percent of armed conflicts took place in biodiversity hot spots, especially in Africa. A new study shows how frequently fighting can spill into areas designated to protect vulnerable wildlife. 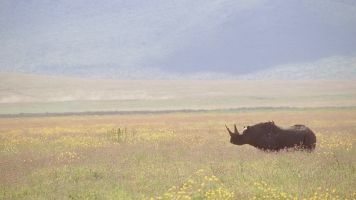 Researchers collected hundreds of records on protected animal populations in Africa to see which were near conflicts, and how that affected the abundance of wildlife. They found during the past six decades, more than 70 percent of Africa's protected areas saw some sort of conflict. Interestingly, decreases in protected animal growth rates were not in areas hit hardest by war, but in places of frequent fighting. For instance, in the Gorongosa National Park, which saw fighting off and on since 1977, 90 percent of the park's wildlife populations were exterminated at its worst point. There isn't a singular reason these animals die. Occasionally, military forces or villages with financial problems will kill elephants for their ivory and bush meat. Other times, these animals die because conflict destroys their habitats, or because fighting puts too much stress on the governments that protect them. Fortunately, researchers noted many parks that lost the most wildlife were not doomed to lose them forever. Only one park included in the study saw some of its protected species go extinct. And at Gorongosa, the park's wildlife has returned to 80 percent of its total prewar abundance. And in many cases, the revitalization of those parks and animals within them can bolster the economies of African countries that lost animals to fighting. In Rwanda, the government has drawn millions of dollars in tourism revenue by reintroducing once lost wildlife into its protected areas.